I’ve just bought a Nissan R33 GTS-T Skyline that is pushing out 480hp (358kW). This is the first time I have owned a turbo vehicle - it is fitted with a MicroTech computer system and a Blitz Power Meter, which I have not a clue how to use (and neither did the car yard I bought from). I’m wondering if you can give me some information on those two items. And I’m not sure what type of turbo it’s running. Maybe you would know - it has M24 and A/V 7 on it. I’d also like to say, this is a great web site - keep up the good work. It is very informative. Instructions on using the Power Meter can be found at www.xspeed.com.au. You shouldn’t need to adjust anything on the MicroTech unit – we suggest contacting your nearest distributor for specific information (see www.microtechefi.com) Not sure on the turbo – it sounds like a Nissan-based turbocharger but can any readers offer some further info? 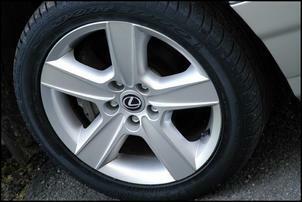 Re Buying Alloy Wheels on the Cheap and Custom Wheel Centre Rings... Are there any updates on the BA XR wheels that were fitted to Julian Edgar’s Lexus?I am looking to fit a similar size wheel to my 1990 LS400 and want to ensure that the wheel is suitable. No changes on the Ford XR8 wheels fitted to Julian Edgar’s LS400. Go for it – we recommend the conversion. Re Zoomin' Serena... 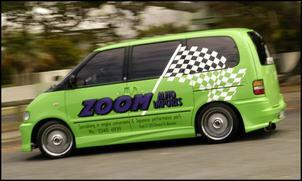 I love the bodykit and what has been done to the Nissan Serena van. Could you tell me where to get the body kit from and a price? We're not sure on the body kit brand - it was removed from a Serena being wrecked in Japan. For further information and availability, contact Troy (the owner of the Serena and Zoom Imports) on +61 7 3348 6939. Front or Back Swaybar Upgrade? Why, on WRXs, can we do the opposite of your recommendation to reduce understeer? We use big swaybars in the front to reduce front roll on the top winning auto-cross WRXs. This means you don’t lose front negative camber... and thus traction. In the U.S. we are using Whiteline 27mm or Stranos 32mm hollow bars (equal to a 29mm solid bar) with spring rates up to 10kg. On my personal WRX I use 12/10kg springs and lighter bars. I came across your website while doing a search for help on silencing the air induction system when using a supercharger. I have recently fitted a new Volvo Penta diesel to my boat and it is fitted with a supercharger (for which we had to modify the intake). I have used the original induction pipe and fitted an air cleaner to it, but it is very noisy - do you have any suggestions on silencing the air intake? Silencing can be achieved by changing the airbox and intake snorkel, installing an expansion chamber on the supercharger outlet and the use of noise insulation material. See the articles Fitting a Supercharger, Part 4 and Technokill: Building a Blown Hybrid, Part 3 for more.